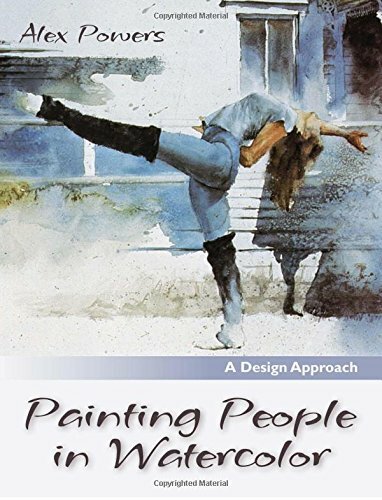 Painting People in Watercolor: A Design Approach by Alex Powers is an old book that was reprinted again 2015. The book is about painting people but techniques are actually more on the art fundamentals. The first part of the book covers the drawing of head and figure. It's a basic guide that talks about the main things to note when drawing the head and figure. It's not comprehensive for sure because Powers only choose to talk about certain aspect he deems important. The next part is the highlight of the book that covers the design aspect. This lengthy section is split into many smaller parts each talking about a specific design technique or art principle, such as using shapes, value, edges, movement, color, line, unity, etc. There are a lot of topics covered, and each concept is explained with Powers' paintings as examples to emphasis the point he wants to bring across. It's quite insightful. All these fundamentals are not just useful for painting figures but also for other subjects. The book also covers the pragmatic considerations such as the materials and techniques used. The book is more theory based than hands-on. There's only one step-by-step demonstration included. And most of what's written in the book are really more on the art principles rather than techniques. In the last few pages of the book, Powers looks at several of his paintings and analyses them. There's also a few pages on topics besides aesthetic considerations, such as inspiration, style, creativity, criticism, etc. One last thing I want to point out is Alex Powers' style of art. It's quite patchy with some abstraction at times. It's definitely not the usual watercolour style defined strongly by shapes and vibrant colours and washes. All the principles taught are sound, and the text are supported by the art, just that I find the art... Let's just say that it's not a style I'm used to seeing.